When dealing with pain, we all want relief and we usually want it fast! Fortunately for you, nature can provide that to you utilizing our Advanced Natural Pain Relief Cream — From head to toe, experience immediate relief from pain, gently and safely, without any need for habit-forming painkillers or medications. Derived from Arnica montana, the RHP® Pain Relief Cream is ideal for reducing or getting rid of muscle pain, joint pain, back pain, head and neck pain, pain caused by arthritis, minor injuries, and much more. It’s also perfect for pain caused by your nerves. If you’re someone who experiences muscle and joint pain from time to time (or on a regular basis), you’ve probably tried quite a few options for pain relief. And you’re probably already using external pain relievers—the kind you apply directly to your skin for fast relief from sore muscles and joints. But have you thought of adding an external pain relief cream to the mix? What’s in our Natural Pain Reliever? joint pain and much more. The best part about this long-lasting pain relief cream? It absorbs quickly, it won’t leave your skin feeling greasy and the slight menthol scent vanishes as it soaks in. So you can use it as part of a massage on larger muscle groups without worrying about sticky residue, or even on smaller areas, like your hands. “I tried several different pain relief creams for my neuropathy. Most did decrease my pain a little but I kept searching. When I got this product, it was a BINGO moment. When my feet just won’t stop burning, I rub this on and rub it in well and within 20-30 minutes, no pain. People who experience pain on a day-to-day basis are sometimes prescribed painkillers or over-the-counter pain medication in order to dull or numb the body. However, it’s not our mission to do so and thus, we turn to natural ingredients. This precise formulation provides us with a chance to live healthier lives knowing, that relief is just around the corner. So yes, there’s hope. These ingredients are safe, effective and natural. Here we take a look what we know to be most helpful in relieving symptoms. Arnica – Arnica montana is a plant from the daisy family with significant medical uses. Arnica plants are quite small – usually no taller than 1 to 2 feet. The flower top of the plant is very delicate, bright yellow in color, and emits a strong fragrance. Uses of Arnica varied, but the plant was primarily utilized in herbal form to help bruising and provide natural pain relief. Since the early days, the known benefits of Arnica have grown. This is (in large part) credited to the development and large-scale successes of Arnica in the form of homeopathic medicine. Menthol – Recognized by the FDA as an active pain reliever, menthol has been used for thousands of years in India and China to control pain naturally. Used topically, it deadens nerve endings in the skin. MSM – A natural form of organic sulfur, essential to health and found in all living organisms. Discovered to be an agent that instantly eases pain when applied to the skin, MSM has also shown to relieve inflammation and swelling by increasing oxygen in the soft tissue whose nerves are the source of pain. It contributes dramatically to the reduction of pain due to arthritis, bursitis (joint inflammation) and rheumatism (stiffness of joints and/or muscles), as well as strained muscles due to over-exertion. Aloe Vera – Contains at least 140 substances beneficial to the body and has been widely used for 3,500 years. A huge variety of injuries and ailments are benefited due to its ability to reduce inflammation and pain, inhibit infection and promote new cell growth. For these reasons it significantly advances the healing process. 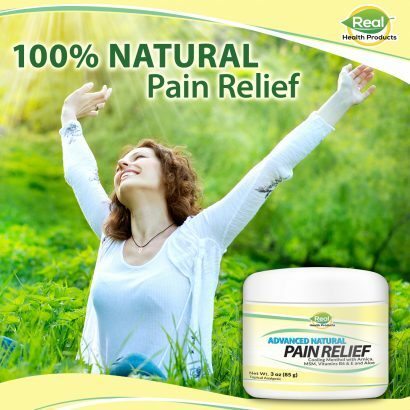 We’re so sure about the effectiveness of the Advanced Natural Pain Relief Cream and that you will experience relief from pain, that we offer a 90-day, empty jar, money-back guarantee on your initial order. Active Ingredients: Menthol USP 3.7% as a topical analgesic. Inactive ingredients: Aloe Barbadensis Leaf Extract, Arnica Montana Flower Extract, Carbomer, Dimethyl Sulfone (MSM), EDTA, Ilex Paraguarenis Leaf Extract, Isopropyl Achohol, Melaleuca Alternifolia (Tea Tree) Leaf Oil, Pyrodoxine HCl (Vitamin B6), Phenoxyethanol & Methyl/Ethyl/Butyl/Propyl/Isobutylparabens, Polysorbate 20, Purified Water, Tocopheryl (Vitamin E) Acetate, Triethanolamine.